Practitioners of ecotoxicology are confronted with some unique problems. For example, when assessing the impacts of chemical contamination (e.g., as result of a spill, a point source emission, or historic sediment contamination) on wildlife species, chemical concentrations at the source (e.g., effluent, water, sediments) may be known but the resulting exposure concentrations and associated risks in affected wildlife species are not. In other cases, the chemical concentration in fish or wildlife are known through monitoring programs and considered of concern, but it is unknown how the organisms acquired their chemical body burden, what the chemical concentrations at the source are, and what source concentrations should be to eliminate the concern. In both cases, it is difficult to justify remediation actions to reduce ecotox-icological risks and improve environmental health of the system as the scientific basis for the cause-effect relationship is either absent or weak. The missing link in both of these examples is knowledge of the relationship between the chemical concentrations in environmental media such as water, air, sediments, and soil, and those in the wildlife species of interest. This relationship is complex. For example, a predatory fish will take up chemical from the water via its gills, ingest contaminated sediments, and feed on a variety of prey items, each of which acquired their contaminant burden via similar mechanisms as the predator. Food-web bioaccumulation models are useful tools to handle this complexity and have been increasingly used to better characterize and understand the relationship between contaminant concentrations in abiotic environmental media and those in wildlife and humans. They have been used in risk assessments, the derivation of total maximum daily loadings (TMDLs) for impacted water bodies, the derivation of criteria for water and sediment quality criteria as well as wildlife criteria, the development of target levels for water and sediment clean-up levels and the derivation of bioconcentration factors (BCFs), bioaccumulation factors (BAFs) and biota-sediment bioaccumulation factors (BSAFs) for chemicals to support the evaluation of large numbers of commercial chemicals for bioaccumulation potential. 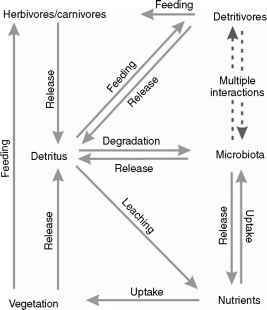 Several food-web models exist. The most well-used models are the ones developed by Thomann and co-workers, Mackay and co-workers, Czub and McLachlan, and Gobas and co-workers. Some of the models are readily available and can be downloaded from the Web, while others can be requested from the authors. When applying these tools to address various goals, it is important to be familiar with the main principles included in the model. It is further important to be aware of the key assumptions of the modeling approach and recognize the limitations of the model's application. It is the purpose of this article to summarize the key model principles and discuss the most important aspects of the application of the model. It is expected that this will guide the reader in further studies.